These Standard Corridor Lockers are designed to offer a sturdy construction, reliable latching, and a premium paint finish. The manufacturer states that the standard lockers are a traditional favorite and are well suited for use in elementary and middle school hallways and athletic locker rooms. 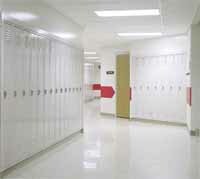 Standard lockers are available in styles that include single-, double, triple-, and quadruple-tier, as well as two-person, duplex, double door and box. They are said to offer secure, trouble-free latching to keep belongings safe and are available in 25 standard color options to complement a range of interior designs. All of the manufacturer's lockers feature full height continuous door strikes for strength and security. They offer full-loop five knuckle hinges that are double riveted to the door and welded to the side frame. In addition, easy-to-read aluminum number plates are mounted on doors or in handle pockets. Republic Storage Systems Company, 1038 Belden Ave., Canton, OH 44705. Tel: 800-477-1255 or 330- 438-5800. Fax: 330-454-7772.